For more running routes, see the Route List. Sometimes I'm overcome by a usually dormant feeling of hope, a stirring of pride. It doesn't happen often, but, suddenly, there it was when I checked into my hotel in Washington last week. Washington is back to life. The city had seen dark times as the murder capital of America (a difficult honor to achieve in the drug-fueled gang wars of 1980s American cities). But a coalition of urban pioneers who risked their lives and fortunes to bring back one seedy neighborhood after another has breathed new life into this city, and the results are a livable community full of breath-taking sights. Washington is one of the greenest of American cities, which is the great fortune of its runners. 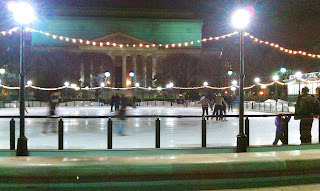 There are parks lining the Potomac river and various creeks and canals, as well at the famous Mall between the Capitol and the Lincoln Memorial on the river (which we'll run here). Monuments, museums, gardens line the parks and provide a rich background to any run, and the parks are full of runners, day and night. 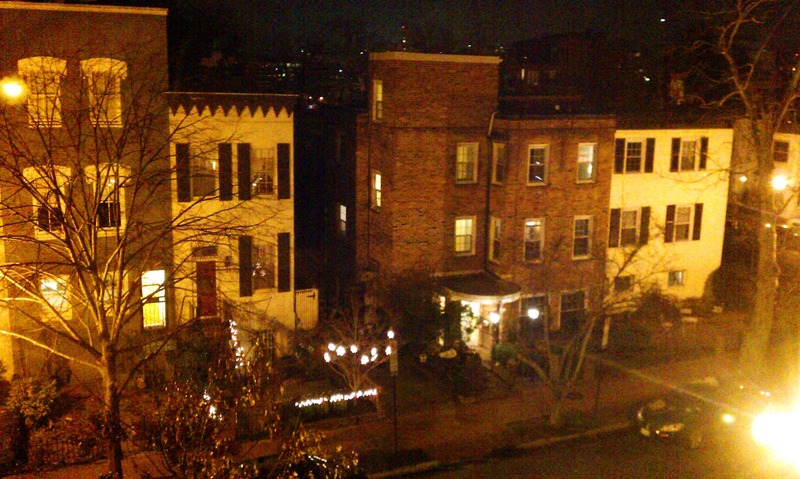 A wide swath of beautifully restored row-houses also provide pleasant running streets from Georgetown eastwards past the Capitol, and southwards towards the Southwest Freeway. 1. 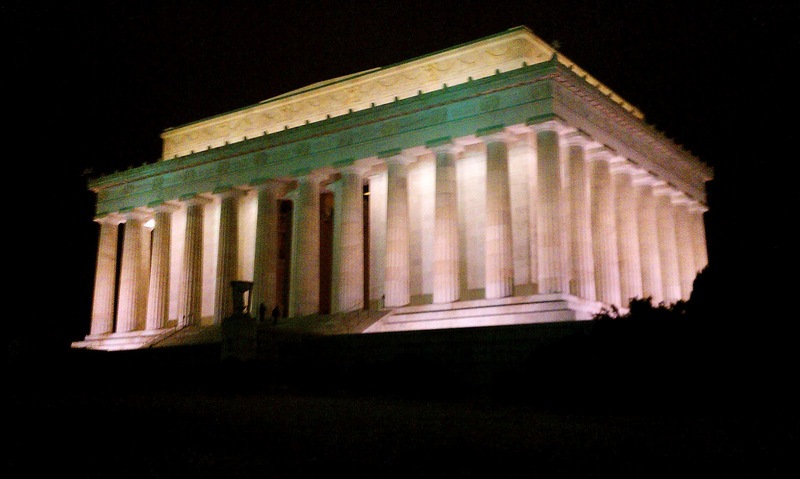 A tour of the national monuments surrounding the Mall. 2. 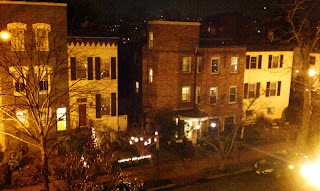 A run along the riverfront from the triangle to Georgetown. 3. A run up the park-lands of Rocky Creek towards the zoo. This run will concentrate on the national monuments in Washington's federal heart, also the town's main running area. Unfortunately, I last ran it in winter, in the dark, as the pictures witness. NOTE: This was only my second trip to Washington. The first was 38 years earlier, as a student reporter following a group of protesters at Richard Nixon's second inauguration, back during the last phases of the Vietnam War. At the time, Nixon was attempting to win a better bargaining position at peace talks by means of a massive bombing campaign, blanketing Vietnam's neighboring countries of Cambodia and Laos with B-52 raids. A group of Zippies was protesting by marching to the Lincoln Memorial with a giant papier-maché rat with Nixon's face, with a blood-soaked doll in its mouth. Their motto was "Rat-ify the peace treaty now" for a counter-inauguration of the "Coronation of King-Rat". At Constitution Avenue, police confiscated the rat. The scene was surrealistic, but the bizarre humor fit the troubled spirit of the times. We'll start the route just north of the Mall, in Foggy Bottom, a neighborhood dominated by George Washington University. There is a Metro station here, so it's easy to get to. The Metro Station is at the corner of I Street and 23rd St. NW., right in the middle of the university campus. The university was founded at the behest of George Washington, as an academy for future leaders. Just run straight south on 23rd Street, through campus and then past the US State Department (which has the nickname "Foggy Bottom", after the neighborhood). In 6 blocks, you come to the Mall, a long east/west park going from the Potomac River to the Capitol building. You will see the Greek-temple styled Lincoln Memorial directly ahead. Run towards it. The Vietnam Veterans Memorial is on your left side, and you might want to take a detour to take a look. It is a simple depression in the lawn, bordered by a wall covered with the names of fallen soldiers, simple and moving. 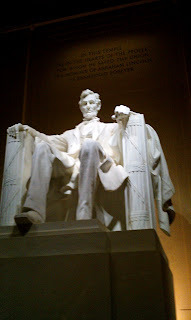 If you climb the steps of the Lincoln Memorial you can see the famous statue of a seated Lincoln, read his moving Gettysburg Address, which ends with the resolve "that government of the people, by the people, for the people, shall not perish from the earth". 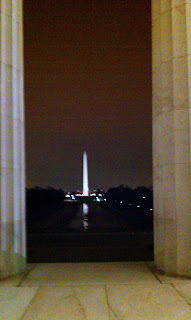 From the memorial, you can also look out over the Mall all the way to the Capitol, about 2.5 kilometers away. The gigantic obelisk of the Washington Monument dominates the view, mirrored in the reflecting pool. The Korean Veterans Monument is off to the right. Even at night, you'll find people silently visiting and photographing the war memorials. I felt humbled by their reverence. Now we'll run straight east through the Mall. Running along the Reflecting Pool, you will pass lots of joggers, and run past some fenced-off areas. The fences are just everyday chain-link fences, nothing like the solid iron fences found in London's or Paris' parks. Somehow, the American sense of style doesn't extend to smaller details. At first, that bothered me, everything looked a bit cheesy. But then I started to realize that absolutely nothing in Washington was ever built by or for a king: everything was done in the mixed spirit of democratic patriotism and bureaucratic cost-cutting, which is one of the refreshing things about the city. After running through the World War II Memorial, you'll come to the Washington Monument. If you lean against its stone walls and look up, you're guaranteed to feel some vertigo. After the Washington Monument, the Mall will become narrower, with a row of museums lining it on both sides. 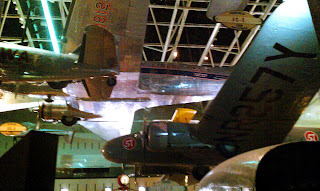 The Smithsonian Museums on the right side are my favorites, especially the Aerospace Museum. You can look in several of its giant windows to view the main exhibits as you go. You can decide to either run close to the buildings on the right side or stay in the middle of the park. Looking into the Smithsonian windows: wow! After the National Museum of the American Indian, you'll come to a big pond reflecting the Capitol, home of the US Congress, crowning a small hill straight ahead. Surprisingly, you can run right up to the building itself, and then run around it along the right side. When you come around to the far side, you'll find yourself at the main entrance. This side is also completely free to public access, and you can run around the east side to the main entrance steps. Now turn your back to the Capitol and run eastwards again, through the last bit of park. You will run straight towards two of Washington's most imposing buildings, the Library of Congress and the Supreme Court. Turn left, running by the Supreme Court, and then turn left again to follow Constitution Avenue westwards around the Capitol, then back along the north edge of the Mall, staying inside the park. This side has several art museums, and the Natural History Museum. 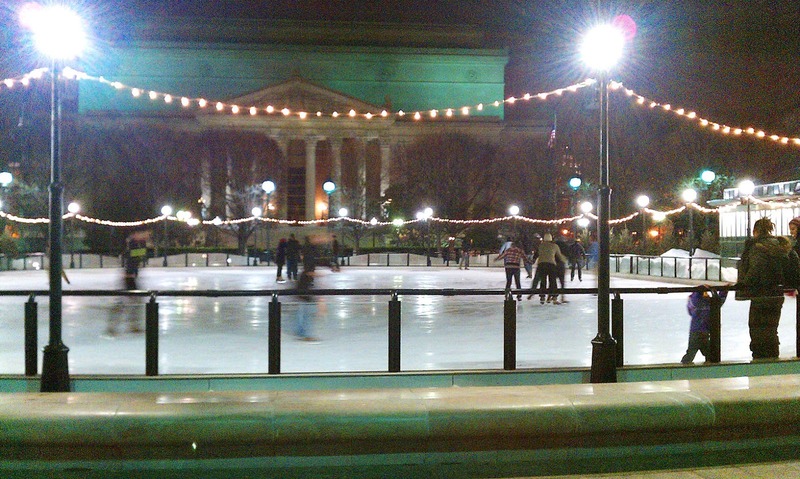 In the winter, the sculpture garden is full of ice-skaters. When you get back to the Washington Monument, turn right (northwards) and cross Constitution Avenue to go into a bordering park, the Elipse. Cross the Elipse, and you'll see the White House straight ahead. The street directly next to this side of the White House is blocked off, so you have to stay along the south side of the street. Run to the left (west) along the street (E Street). In just a block, you'll come to another little park, Rawlins Park, which you can run through. At 21st Street, turn right to run north through the George Washington University campus again. At I Street, turn left and run the last 2 blocks back to the Metro station. I ran almost the same route starting from Arlington Cemetery the day Obama went there with only some bodygards, to come to terms about his next steps in Afganistan (9.11.2011). It really was a great run on sunny day, I highly recommend it! Wow, Washington is always able to deliver some surprises. It was one of the most inspiring runs of my life, I know. Glad you enjoyed it so much! A great site, Keith! Thanks for sharing! I am training for a marathon and need to run 20 miles. Is there any drinking water on this route as I will need to run it 3 times. Thanks. Hmm, I didn't keep my eyes open for water fountains when I ran this, so I can't say for sure. But as this goes through parkland the whole time, I would be surprised if you didn't pass a few fountains. Can anyone else add something here? Good luck! There are many water fountains along the National Mall, but they turn them off during the "winter", which is roughly November - February. Or you could buy bottled water from one of the many vendors along the Mall. For doing something like 20 miles I strongly recommend combining this loop with something along the Potomac River and/or going north into Rock Creek Park. I'm heading to DC next week - thanks for posting these routes. I plan to run one or two of them during my trip. Thanks Jessica: Enjoy your trip to that beautiful city! I'm there for business this Wed-Thurs and have started taking pics from "places I have run." Figure if I have to travel for work, might as well make the most of it by seeing the places they send me and getting a little exercise as well. Is it safe to run there early AM, like 5:30ish? Maybe someone else can say something about that, Muellers. I only ran evenings, but it was full of runners and other sight-seers then. I like your attitude: running is such a great way to experience any place you go! I stayed in DC for 3 nights this past week and ran the Mall each morning. The earliest time I ran was around 5:45AM. It was still dark at that time but I felt perfectly safe. I felt less safe walking there from my hotel but it was only a 5 minute walk if that. There were a few runners already there in addition to at least one park worker watering the grass. The beginning of my run was around the Capitol and there were plenty of police in that area. 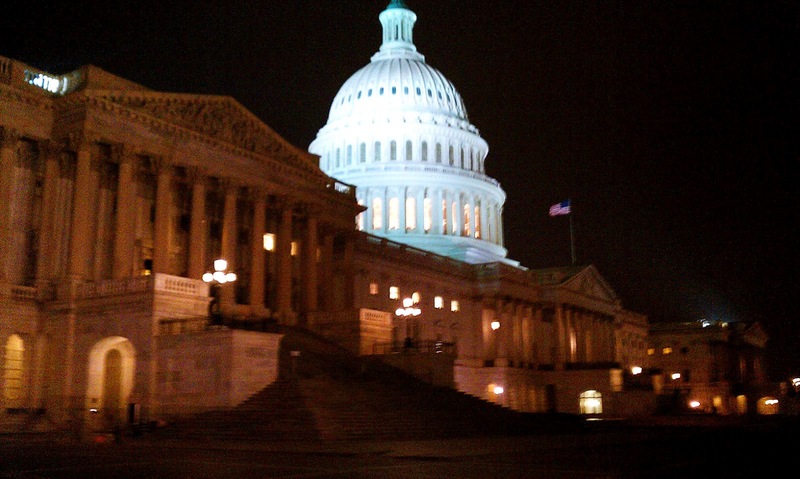 It's amazing that you can run right up to the Capitol building. You can't get anywhere near the White House. It didn't take long for the Mall to fill up with other runners. I didn't run in the evening but it is definitely more crowded at that time. It was an awesome running experience.